Replaced Gatorskins with Four Seasons. My Vigorelli came with 25mm slicks, upgraded to the 28mm Gatorskins. Ran the Gatorskins for 5600 miles. Bought 28mm Four Seasons, but the rear tire was too large for the rear brake housing on Shimano 105s. Western Bike Works exchanged them for 25mm. Pumped up to 100 psi, the tire width is 26.51mm, measured with electronic caliper. Perfect tire for how I ride. Love them. My training rides are 40 miles, over Houston streets, then concrete bike lanes along the bayous. Club rides 30 - 50 miles long. These came highly recommended for my somewhat rough country roads and occasional gravelcaliche segments of rides. Never had a flat on them. They are, however, a noisy tire, more so than Michelin, Vittoria, Hutchinson I have used. Grip was on par with other tires. Good tires but there are equally good tires that do not have the road noise. ARE GP4S POSSIBLY THE BEST ALL AROUND, HEAVY-DUTY TIRE OUT THERE? I run 28s on both my winter training gravel bike (CX) as well as a tandem. I've ridden on all kinds of gravel roads and even on a few MTB trails with them. On the tandem we've recorded descending speeds of over 60mph and find them totally trustworthy. Logically, they are slightly heavy, but otherwise great handling, super durable, and hard wearing. My go-to tire. I used these tires on my steel frame road bike to ride across Bhutan in 2012. Despite the rough conditions, I never got a flat. I live in an area that has a lot road debris and flats are very common. I have tried several different tires and brands and always come back to these tires for training and commuting. They still get cuts and punctures, but they are more durable than almost any tire I have ever used. 20 of 22 customers found this review helpful. I use the Grand Prix 4-Season on both my road racing bike and my commute bike, it handles well, and offers more puncture protection than a race tire. These are great tires, rain or shine, which is especially good for those long winter months (here in Portland, OR, anyway). If you find yourself faced with snow in winter, a studded winter tire is more up your alley. Bottom line, this tire handles nearly as well in rain as it does on dry ground. It's a great purchase for anyone who rides in all conditions, and wants a durable tire that feels good. Like many other reviewers I am a big fan of these tires. The only improvement I'd like Conti to make is to go one size wider. If I could I'd ride a 28 on the front and one size wider in the rear during the winter months when I'm commuting in the dark. Ride about 2,000 miles per year and have used the GP 4-season for 15 years or so. I have had very few flats, probably less than one per year on average. Great traction and handling. Hard to beat this tire at the sale price. Conti tires are the best!! I have been riding Continental tires for over 15 years - GP 4000, 4 Season and Gatorskin - I love the ride characteristics and flat resistance and durability. The 4 Seasons has become my year round road bike tire and the Gatorskin(32) is my winter street ridingcommuting tire on gravel bike. I would recommend Continental tires to any and all asking about tire recommendations. I bought a set of these a couple of years ago for my road training bike. After over 3,000 miles, I've not experienced a flat. Rolling resistance is light, and they hold their grip very well, though they do get a bit sketchy in heavy rain. Higly recomended , durable tire. I use this tire on road bike. I use it on asphalt surfaces 40 to 80 miles per week. Durable, low rolling resistance, flat free . Tread lasts for over 2000 miles. I am on my 4th or 5th set. I have not found a better road bike tire. I love these tires. Great Traction. Perfect all around tire. The Grand Prix 4-Season offers me plenty of options. Great for the road and for a bit of off-roading as well. It might require more watts to push it but look at it this way, you're getting more of workout! The grip has been great including on wet patches. It does have better puncture resistance but you will find something that can cause you to have a flat, I certainly have. At the same time I have rolled through plenty of stuff that would have flatted lesser tires. This is now my preferred tire and I love the size options as I use a 32mm. These tires are nearly as tough as gatorskins but lighter and with better road feel. I get maybe 1-3 flats a year that are virtually inevitable no matter the tire. Cornering is confident and performance in wet conditions is also very reasonable (I've been on several other tires that are most definitely worse). Putting these tires on my crossgravel bike made a big difference in road performance. They are ok on gravel but lose traction on steep climbs. I plan on lowering pressure and trying again, however you obviously lose performance on the tarmac in doing so. I love Continental tires but was disappointed with the quick wear and constant sidewall cuts I was getting on my 4000s tires. I decided to try the Grand Prix 4 season as a last chance with Continental. I do a LOT of riding and was tired of changing flats. 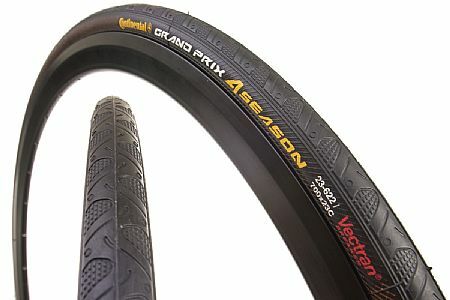 since I switched to the Grand Prix 4 Season, I have not had a single flat. The tires wear like steel (i.e. long tread life!) and are tough. I ride in all conditions, year round in Colorado and regardless of the gravel and debris I encounter, these tires can take it!